Large-size marble-effect slabs in white porcelain stoneware. 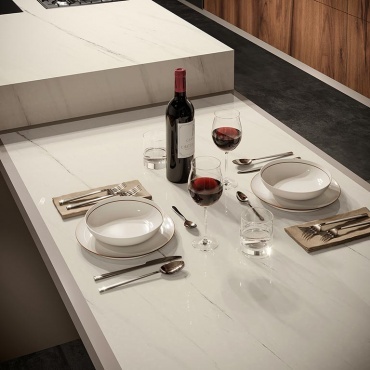 An intense, luminous white, interrupted by delicate shading and very fine, dark veining. Bianco Dolomite by Atlas Plan is a refined, minimalist material, the perfect combination of light and matter. These ceramic slabs go perfectly with other porcelain stoneware effects, in each case creating a unique setting. The slabs are available in a glossy lapped finish with a thickness of 12 mm. The white colour of the slabs makes them ideal for use throughout the home, for tables, islands, backsplashes and worktops. Also ideal for bathroom vanity units and bar counters. Bianco Dolomite Habitat: the Bianco Dolomite Lappato Lux slabs are paired with Boost Tarmac by Atlas Concorde for concrete-effect flooring. The materials, objects and colours make the domestic setting elegant and functional.